This week I read that Chris Dorner, the LA police officer who sought revenge by killing some people, had a manifesto. “Like the Unabomber,” wrote the news reporter. Manifestos aren’t only about destruction, you know, though they seem to get a bad rap. They can give us focus. They can speak our heart’s lovely desires and our life’s creative purposes. Some time ago, a friend was in professional transition, and asked me to help her draft her “elevator speech,” the one she would use anytime she was able to steal 30-60 seconds with someone who might have a job connection. More recently, I was asked to write a faith statement, something I could tell to anyone who asked. Then, in typography class this week, we were assigned to choose 80 or more words that mattered to us – song, poem, speech, whatever — and integrate them into a design. Mostly it’s a about learning to work with type, but I found the biggest challenge in choosing the 80+ words. I considered “this land is your land,” by Woody Guthrie, especially the verses we don’t sing. Know this one? Next, I thought of “here’s to the crazy ones” (which may be Jack Kerouac, Steve Jobs, some folks in the marketing department at Apple, or somebody else altogether); I considered the Ira Glass thing on not giving up, and Anne Lamotte’s irreverent reverence. I thought of “Passover Remembered,” by Alla Renee Bozarth, with its raw images of what freedom can do to a person and to relationships; I often read it in worship during our poverty events at UrbanSpirit. I pondered the UN’s Universal Declaration of Human Rights, and excerpts from any number of books I’ve read – Goad, Ehrenreich, Krugman, Kozol. Poets and preachers, from Jackson Browne to Jeremiah Wright; Holly Near and others in the “women’s music” genre who were early influences for me. (“It takes every muscle in my heart to dance at our revolution, but I’m dancing, Emma.”) I thought about Sojourner Truth, Jesus, theologians, scripture, and the psalms and prophets that move me. There’s a lot to consider! 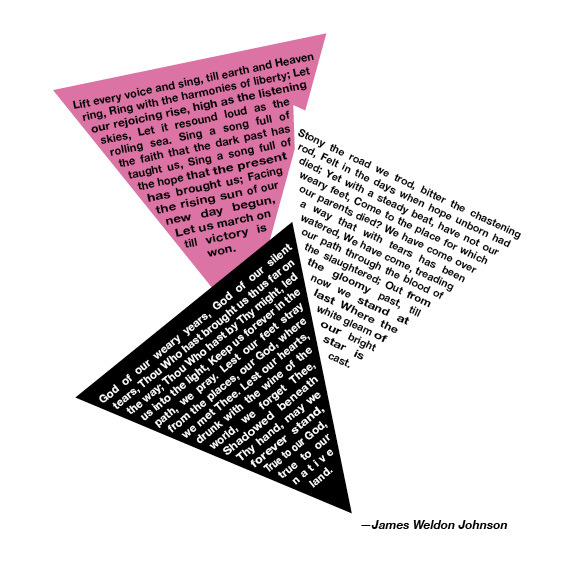 Finally, I landed on the words of the hymn by James Weldon Johnson, “Lift Every Voice and Sing.” Sometimes called the Black national anthem, it is a liberation song. So, for this assignment, I set it into the symbols of the gay community — symbols of Nazi genocide, burned into our psyches as they were carved into our forearms, symbols that we only later claimed as our empowerment. I also hear these words speak powerfully to the never-ending struggle for economic human rights; they move me, often to tears. This song I’ve chosen isn’t my manifesto, exactly, and it isn’t my elevator speech, but it does call me to consider who I am, where I came from and what I want my life to be about. My classmates in typography at Ivy Tech SoFAD are an interesting bunch of folks. We are all white, and mostly from Louisville/Southern Indiana, but we come from multiple generations and circumstances, and bear our varied perspectives on the world. They educate me; I hope I do the same for them. I’m asking them to post their choices, and offer a word or thought about how they decided. I’m asking you, as well: what moves you? What would your “80 or so” words be? If you’re willing, add yours — or a link — in the comment section. taxes and churches: time to talk? The ministry center I run, UrbanSpirit, used to own a church building. A big, old church building, with, um, issues. Not the least of the issues were the beasts that constantly set off the motion detectors — spider webs, a rattling door. My cat Beckett, which is how I came to adopt him. The alarm system also warned of actual intruders. It was these the alarm was intended to guard against. The problem was there were way too many of the other things. In the beginning, the alarm company would call the police, and I would meet them there, sometimes deep into the wee hours, fearful of what we may find. Most times it was nothing, but sometimes it was something. Either way, I was awfully happy the police were willing to be the ones to figure it out. Eventually, the police department began charging a fee for false alarms — not just us, but folks all over the city. You get one or two freebies, and then you pay. First $25, then $100, I think. I’m not exactly sure of the fee scale. I thought about being annoyed by this, or trying to appeal. And then it hit me. As a church, we pay no property taxes, so this fine is our way of supporting the work our community protectors do. I began to think of all the other things we get free — lights and streets, bad weather alarms. We had a fire once, and no one sent us a bill for the firefighters’ effort, or the truck time, or depreciation on the equipment, or for the water, which came from a hydrant and wasn’t on our meter. We get a lot of stuff absolutely free. Because we are a church. Are we worth it? This Sunday, I’ll be leading a discussion at a local church about churches and taxes. I prepared a sheet of info as a discussion prompt. It isn’t a research paper, and all the numbers may be wrong. But it seems worth conversation in a time of stretched government budgets, whether the church is sucking communities dry or providing in-kind value that is way more than the exemptions. The discussion page is below, and you’re welcome to use it for discussion in your own congregation. I’d love your comments here, which certainly would enrich the conversation I’m about to have at church this Sunday. The church, we say, is all about justice. What is just in this regard? And since no one is likely to change the exemption laws anytime soon, the question for clergy and churches is, as always, what kind of neighbors are we?